After being back in the US for several days, our project in El Salvador feels like a dream! 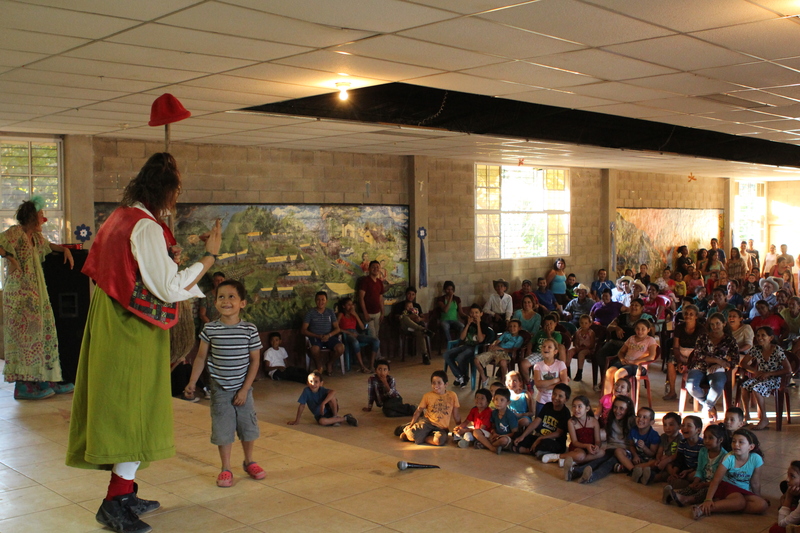 21 shows and 3,800 children served in three different regions of the country…it was such an amazing trip! This project was personally fulfilling in many ways, to include witnessing how our efforts made positive impacts in local El Salvadoran communities. CWB USA workshopped with local partners to discover new skills, as well as shared laughter with thousands of children. Additionally, our work helped support local micro-economies for the brief time we were in country. To our local coordinator, who has been a resident in El Salvador for 20 years, and has been a strong solidarity worker during that time. She spends much of her time working with her chosen family in Santa Marta, a community that was born from the displacement and subsequent resettlement from the war. She communicated with all of our in-country partners before our arrival, and coordinated many of our in-country logistical needs. This was her first time travelling with clowns. To our local driver, an incredible and kind individual. He owns the bus that we called our transportation/green room/dressing room/closet. He has a wife and three children, and lives in a satellite-city of San Salvador, where his family’s quality of life is constantly threatened by gang violence. He explained to me that they’ve been able to keep their children safe and ambitious. They achieve this through hands-on parenting, and their ability to be with their children and nurture them every day. In a country where many children have at least one parent working abroad or away from the family, this is a gift. 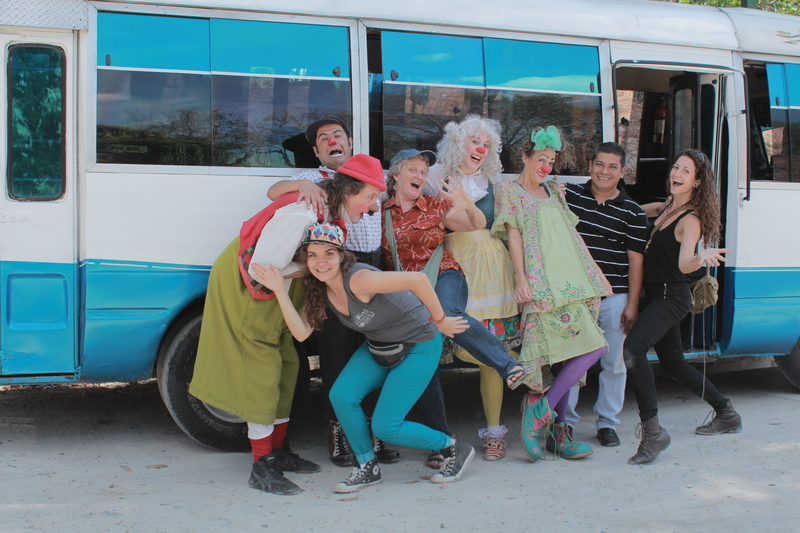 Transportation/Green Room/Dressing Room/Closet – maybe the most versatile bus in El Salvador! 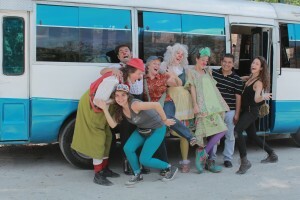 To our incredible hostel in San Salvador. This place is run by the four most caring El Salvadoran women, so accommodating and sweet. They always seemed so happy to see us. They graciously allowed us to cover the common space with clown props while we put together the performance, smiled through accordion and trumpet practice, celebrated birthdays with us, waved goodbye whenever we left and hugged hello whenever we arrived. It was such a pleasure to be with them. To a locally owned and operated eco-lodge in San Vicente. For three nights we stayed in these cabins, and most days we would give the manager of the property (a very kind middle-aged woman, with short, dark hair) a ride into town on our way to the performances. The folks at the eco-lodge have a beautiful dream of highlighting the environmental beauty and richness of the region. To our local home-stays. Kind and generous local families in Santa Marta, opened their homes to us and received us with grace. My host mother was a grandmother named Martha, about 5 feet tall. Our room (shared between three of us) was sparse, but very clean and comfortable, with tile floors (the easiest for mopping), and walls that almost reached the high ceiling, leaving about a foot of room to let sounds mingle from the rooms in the house. There was an outhouse and a washing station outside of the building, and our mother had prepared a tub of water for us to bathe, though the community hadn’t received water in 31 days. At one of the other homes, I helped one woman, a founder of the community, prepare tortillas for her household (or rather, she taught me how to prepare tortillas, and we all giggled about how much more graceful and precise hers were). The economic and political difficulties of El Salvador have made life hard for the people of Santa Marta, where every resource is precious and no service guaranteed. To be hosted in Santa Marta is such a gift, and it’s one that I cherish. To local restaurants (and houses). Aside from a couple of emergency gas station snack breaks, we ate all of our meals at restaurants owned and operated by local folks (or at the homes of local folks who turned into restaurants for us!). Often we were served by the lady who did the cooking, who also gave us our receipt and cleaned up after us at the end. A true one-woman operation. For lunch one afternoon in Victoria, we brought a table of 12 to eat at a small restaurant in Victoria, a small town at the base of the mountains. We were seated at one large table, in the front room of the building. In the back, our host and her helper cooked tortillas, chicken and vegetables over an open fire in their highly productive kitchen. On the wall in the dining room was a poster, featuring our host and her mother. After lunch, I asked her about the poster. She confirmed that her own daughter had made it for her as a gift, after the passing of her grandmother. She said that her children loved her very much and that she had been blessed by God to receive them. For another lunch, we once again huddled a group of 12 around a small table, this time further in the mountains. The house hosting us was the home of Don Alejandro, one of the founders of the isolated community. Their house sat nestled against a lake, around which the community grew. We were given steaming bowls of menudo (tripe soup), and plates of boiled vegetables with yucca. In the middle of the table sat a steaming tower of tortillas! During lunch, six young boys came to watch us eat, all cousins. One of the clowns finished eating and started teaching the boys stick balancing, much to the pleasure of every person sitting around at the table, on the low wall, in chairs and hammocks. Our food was cooked for us by the mother and grandmother, and their hospitality and appreciation for our being with them was truly heartfelt. Each of these opportunities to connect was so wonderful, inevitably followed by hugging, endless thank you’s, and an applause for our incredible cook! As I complete the balancing of the budget, it feels rewarding to reflect on where a large portion of the money went for this project (airfare to El Salvador accounts for rest). To know the faces of these people, to feel confident about every dollar that we spent – knowing that it is going directly into supporting individuals who are doing great work in their own worlds, and overcoming humanitarian crises, is what inspires me to continue to seek out partnerships with small, local, grassroots organizations and community leaders. I am so grateful to each of our donors. 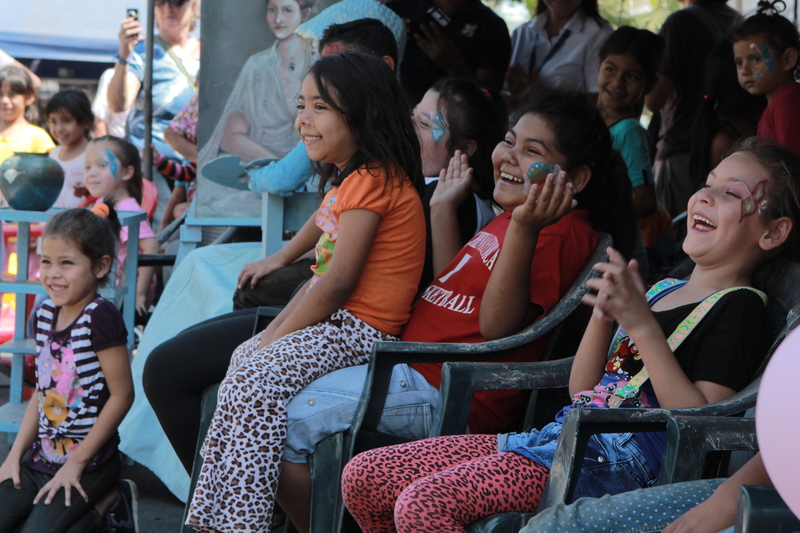 All together, if we factor the budget with the number of people served, we arrive at this happy equation: For every child and audience member whom we connected with in El Salvador, we spent $2.10. Less than a latte. I’m going to pledge as a recurring member, because at $5/month, it’s worth it for me. Children cheer during a show in San Salvador.